The Pleasant Elementary School Staff believes that all students can learn to their fullest potential. The mission of Pleasant Elementary School is to ensure that all students experience success academically, socially, morally, and physically. Pleasant Elementary School staff members utilize current, standards-based curriculum, and instructional strategies/practices to improve academic achievement. 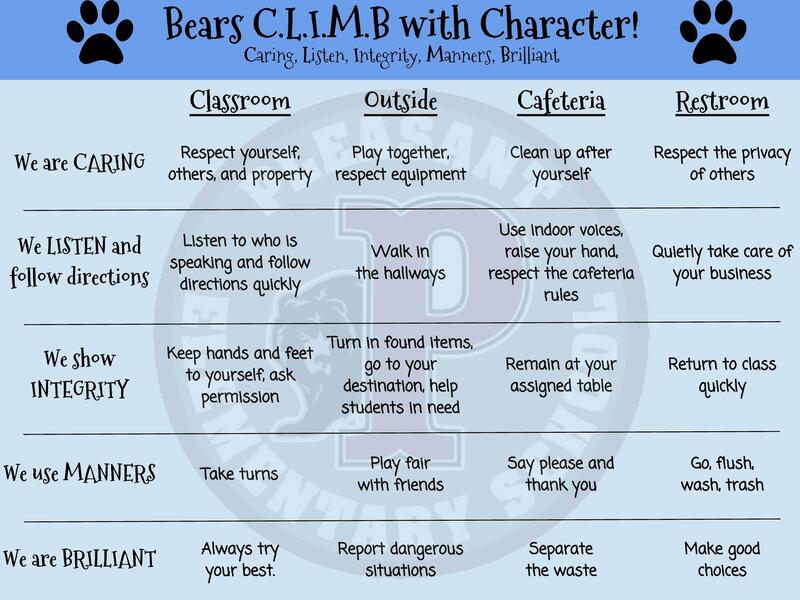 Staff members use Character Counts® as a common language to develop students' abilities in demonstrating character and responsibility for themselves and their community. Staff, parents, and students work well together to provide a climate that empowers everyone in an effort to maximize learning. Pleasant Elementary is a Character Counts® school. We not only teach our students how to show good character, we also practice often. To maximize the results of this program, we have developed a guide (found at the side of the page) to help everyone remember what good character looks like.